Henri Vidal is traveling to Ragz, Hungary (via the Danube River) to join his brother Marc, who is there and engaged to be married Myra Roderich. Henri learns that Myra’s hand had previously been asked for by Wilhelm Storitz, son of famed alchemist Otto Storitz. Henri is warmly received by the Roderich family and plans get underway for the wedding festivities. At the first event, there is a disruption German hymn “Song of Hatred” is sung from a voice coming from nowhere, a bouquet of flowers is destroyed on its own and the future bride’s wreath seems to fly through the air on its own out of the building. 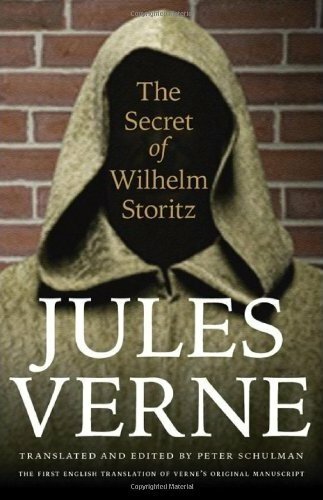 The spurned suitor Wilhelm Storitz is the number one suspect, but no one is able to find him or his servant as they both seem to have vanished into thin air. The wedding ceremony at the town hall goes without problem, the religious ceremony the next day is interrupted by the voice they know is Wilhelm Storitz “Woe to the married couple! . . . Woe! . . .” As a result the bride falls into a coma and the search for Wilhelm Storitz resumes in earnest, but how do you find what appears to be an invisible man? Translator & Critical Material: Peter Schulman. Lincoln, NE, Bison Books (Univesity of Nebraska Press), 2011. 240 pages, 0 ill.
Get the softcover at Amazon.com or Barnes & Noble. There are no known reviews by any of our members of this edition; however, the translation and all critical material is done by one of our members. Translator and Introduction: I.O. Evans. Westport, CT, Associated Booksellers, 1963. 190 pages, 0 ill. There are no known reviews by any of our members of this edition, but here are some thoughts on it by member Dennis Kytasaari.